If so, what type of beard? Or maybe women prefer clean-shaven? We had the same questions and decided to get to the bottom of it. The only way to find the real truth is to ask a large representative sample of women the right questions. That is why we performed a major nationwide survey of over 300 women in order to find the answer. The results presented below will tell you the true consensus of what types of facial hair women find most attractive. Please refer to the table of contents below to jump to the sections most important to you. Use the ‘^’ arrow on the bottom right of the screen to return to the top of the page. Video: Do Women Like Beards? Below is a short video of the top 5 highlights from the survey results. 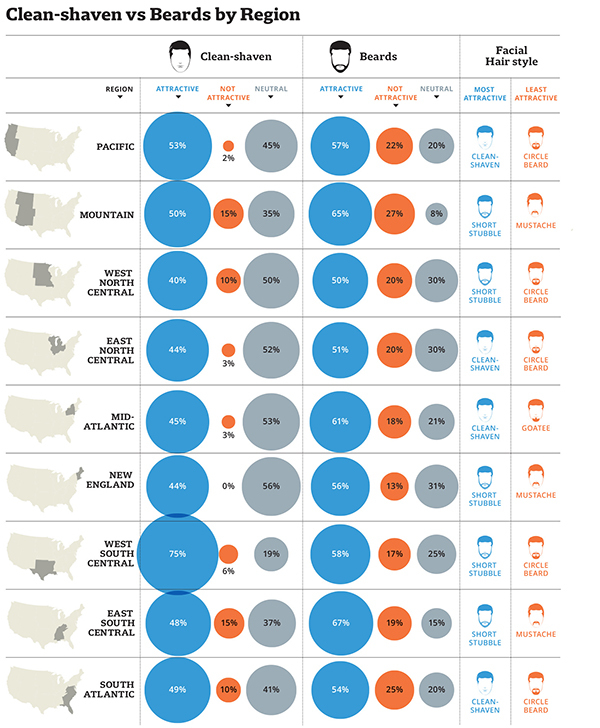 Also be sure to check out the many other informative graphics and interesting findings per the rest of the article below. Most advice on what facial hair styles are most attractive to women are provided by one or two “experts”. As much as I respect the opinions of these individuals, I decided to take a different angle and obtain the information straight from the source (i.e. the women). As I am a true believer in the law of large numbers, I am not just talking about asking the opinion of one or two women, I am talking about getting the opinion of a large representative sample of women that is sufficient to arrive at statistically significant conclusions of what women really think is attractive. That is why we contracted a world leader of web-based surveys to assure we got a true representative panel of women, who provide truthful and thoughtful responses, so we can be sure the data collected and conclusions presented are credible and accurate. We also took the analysis a step further and identified any significant differences in facial hair preferences between various geographic locations and demographics. Provided are the details of the random stratified sample as well as the precision estimate calculations. For more details, refer to the Survey Methodology here. We asked women to rank 7 of the most popular facial hair styles from most attractive to least attractive. The following are the results and analysis for the US Population as a whole. The “Short stubble” beard is the #1 most attractive facial hair. 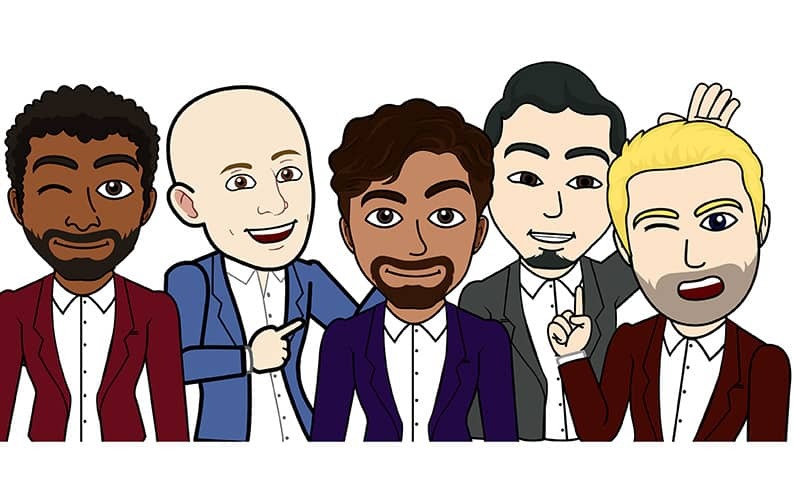 It received an average rank of 2.6 with 80% ranking short stubble in the top 3, including 24% of respondents ranking short stubble as the #1 most attractive facial hair style. “Clean-shaven” was a close second as the most attractive facial hair style. It received an average rank of 2.7 with 72% ranking clean-shaven in the top 3, including 38% of respondents ranking clean-shaven as the #1 most attractive facial hair style. “Long stubble” came in 3rd place with an average rank of 3.7. “Full beard” and “Goatee” were practically tied for 4th/5th place. “Mustache” and “Circle beard” were ranked as the least attractive facial hair styles. So do women like beards? Well, based on the results above, it seems to depend on what type of beard. Why do women find short stubble the most attractive facial hair style? Is it because certain celebrities or publications feature short stubble beards or is there a more technical explanation? Is the short stubble a recent trend or has it been the most attractive facial hair style for a long time and will it continue to be so? 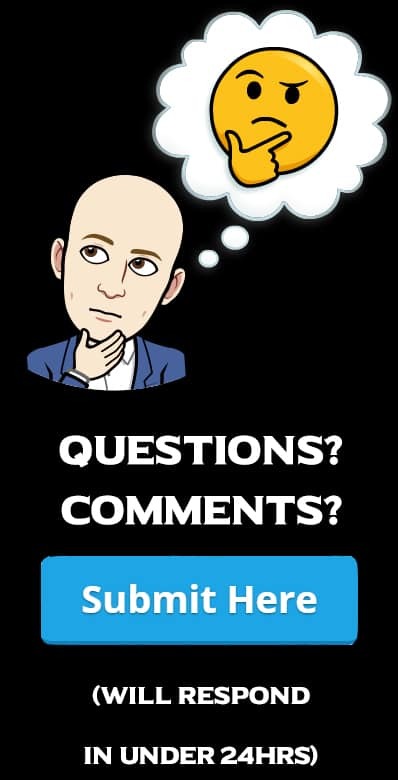 Feel free to comment or pose your own questions in the comment section down below. More women find beards “attractive” compared to clean-shaven. More women find beards “unattractive” compared to clean-shaven. There is a much greater polarity among women’s opinions of the attractiveness of beards versus the clean-shaven look. 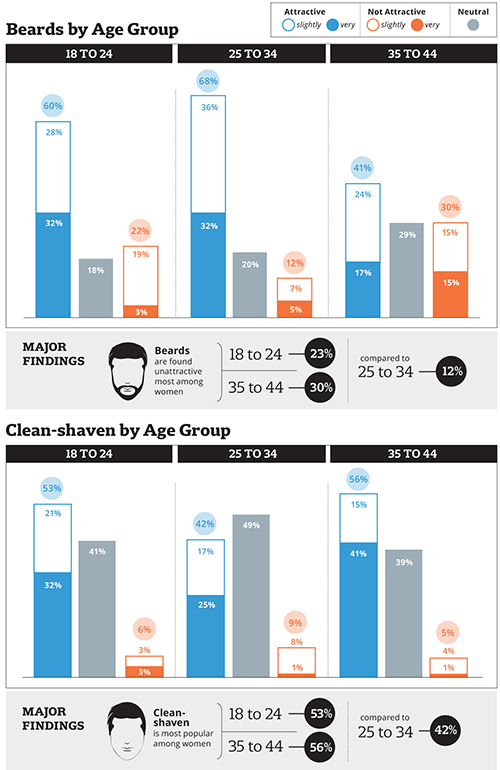 14% more women think beards are “attractive” relative to clean-shaven (57% vs 50%). But 21% also think beards were unattractive, including 8% that think they are “very” unattractive. Compare that to clean-shaven where only 7% think clean-shaven is unattractive, including only 2% “very” unattractive. That means 3 times more women think beards are “unattractive” relative to clean-shaven. More women had a neutral stance for clean-shaven as almost 2 times more women selected neutral for clean-shaven (43%) versus beards (22%). So do women like beards or clean-shaven? It looks like some women really like beards but other find them repulsive but while slightly fewer women find a clean-shaven look attractive, not as many women find a clean-shaven look unappealing either. Why do women have stronger opinions on the attractiveness of beards (both attractive & unattractive) versus clean-shaven? Do you believe women’s attraction to beards and clean-shaven have always been like this or is it constantly changing? Where do you think it is headed? We segmented the data between 3 age groups (18 to 24, 25 to 34, 35 to 44) to determine if there were any statistically significant differences in their attraction to facial hair. Women 25 to 34 find beards significantly more attractive and clean-shaven significantly less attractive compared to women 18 to 24 and 35 to 44. While only 12% of women ages 25 – 34 find beards unattractive, 26% of women in the age groups 18 to 24 and 35 to 44 find beards unattractive. In other words, more than twice the amount of women 18 to 24 and 35 to 44 find beards unattractive relative to women 25 to 34 (117% to be exact). This preference for facial hair by women 25 to 34 was also reflected in the question regarding the attractiveness of a clean-shaven look in which 29% more women 18 to 24 and 35 to 44 find clean-shaven attractive versus women 25 to 34 (54% vs. 42%). Based on the results above, whether women like beards seems to also depend on certain demographics such as their age. Question: Have women 25 to 34 always been more attracted to beards than other age groups or is it more of a generational influence due to the passing golden era of beards? Here are the results of the most attractive facial hair by age group. We broke down the following data between the 3 types of communities where the respondents were currently residing (Rural, Suburban, Urban/City) to determine if facial hair preferences differ based on the type of community women live. Women residing in rural communities find clean-shaven significantly less attractive than women in cities or suburban communities. 24% more women of city or suburban communities find clean-shaven attractive compared to women in rural communities (52% vs 42%). 4 times more women of rural communities find clean-shaven unattractive compared to women of city or suburban communities (16% vs 4%). Question: Is there a specific cultural influence in rural communities that may explain why they don’t find clean-shaven as attractive? We segmented the data by geographic region to determine if there were any differences in women’s attraction to beards among the different parts of the country. 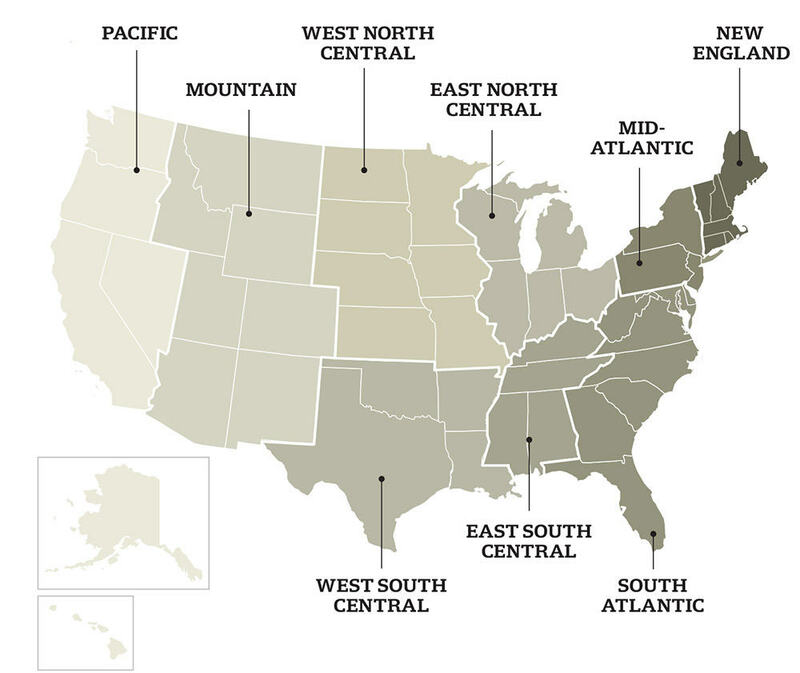 Below is the data as well as a map indicating which states are included in each region. Women from West South Central (Texas, Oklahoma, Arkansas, Louisiana) find clean-shaven the most attractive out of any region with 75% selecting it is attractive. Women from West & East North Central find beards the least attractive but were also fairly neutral of the clean-shaven look. Women from the Mountain region were the most polarized for both clean-shaven (attractive:50%, unattractive:15%) and beards (attractive:65%, unattractive:27%). 72% more women with household incomes of $100,000+ found beards unattractive when compared to women with incomes less than $100,000 (31% vs 18%). No statistically significant differences in women’s facial hair preferences were identified when segmenting the data based on relationship status. Please submit questions you want to have included in the next survey in the comments below! It can include anything related to grooming, style, and beyond. These surveys are expensive to conduct but we will do our best to include as many requests as possible. Also, please submit any comments or questions you may have regarding this survey as well. 38 to 24%. Clean shaven would win, no? 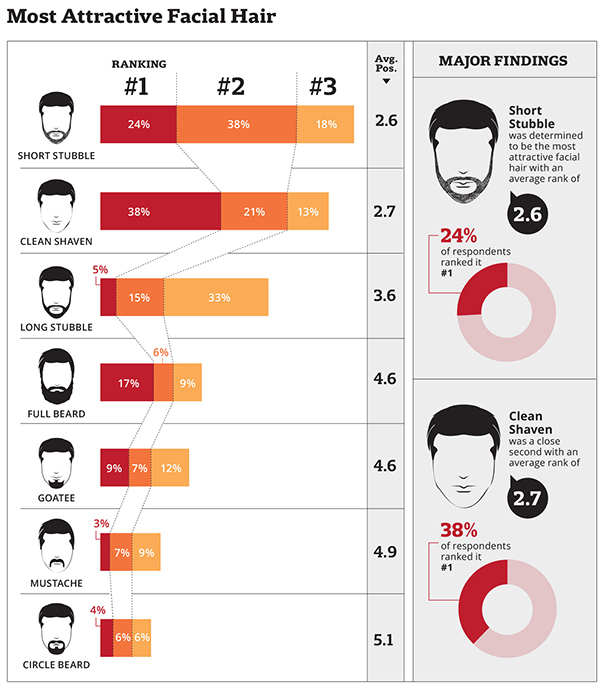 Well, more women rated it #1 but the average position of “short stubble” was 2.6 vs “clean-shaven” which was 2.7. 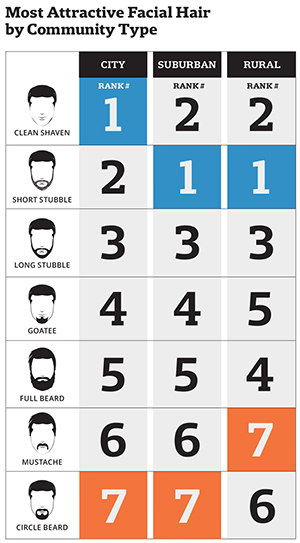 The average position is how I ranked the facial hair styles. Why did you leave out all the women over 44 years? Do you think hey stop looking at men? Or do you believe that women over 44 are irrelevant because only women under age 44 are appealing to you? Thanks for your question and I assure you the last thing I wanted to do is to offend anyone so I sincerely apologize if this was the case. This segmentation in no way reflects my own preferences in any fashion. The initial reason I conducted this survey was due to the fact that there was a large demand from PrimandPrep.com’s readership. The demographics of my readers are primarily between the ages of 18 to 44. 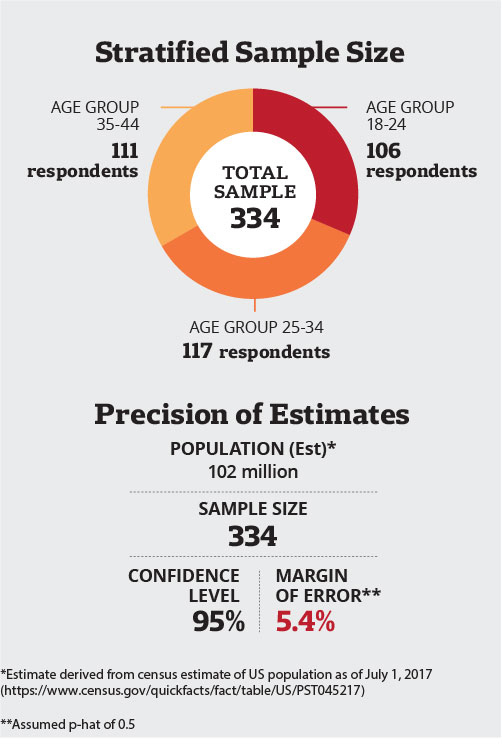 As the per respondent cost of these surveys are costly, I decided to focus the survey on these age ranges. Now that the survey was a very large success and received significant coverage beyond just the PrimandPrep community, I will be sure to invest more and assure greater inclusivity of the total population, including all ages. 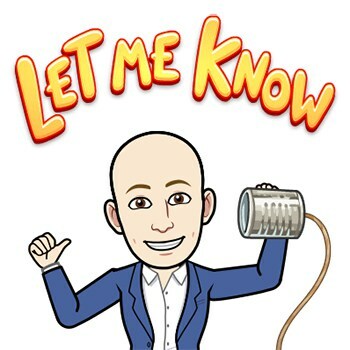 I hope this response is satisfactory and please don’t hesitate to ask me any more questions or provide any more suggestions for the next survey. Thanks! Glad your found it insightful. It’s great– really well presented analysis. It’s always interesting to see how my intuition about of societal preferences differ from the actuality– I thought way more women were into beards! Honestly, I’d be interested in the dispersion of data and if the findings would be similar with a larger corpus of data. 300 isn’t a huge representation. How were the subjects chosen? I’m so glad you found this survey enlightening. The survey was conducted through Survey Monkey Audience who perform a random selection of respondents throughout the United States consistent with generally accepted survey practices. Based on the sample size, the calculated margin of error is 5.4%. Based on this calculation, I think the dispersion of data would be fairly consistent if a larger sample size was used. Great study man and I really appeciate the research you put into this. So glad that you found it helpful. I will be performing many more in the future so be on the lookout! I like a clean shaven man. Got plenty of face “rashes” from making out with guys with scratchy stubble. A beard hides the man and an older guy with a gray beard? Looks like Santa Claus. Not a good look, not a turn on – at all. They look like they have given up. Even my old Grandad shaved every day. The very handsome Keanu Reeves looks better without his beard, although at least his beard looks soft, is not heavy and does not obscure his looks too much. Didn’t bother to shave for a few days, okay. Back woodsman or ZZ Top? Not so much. Also, most men with beards have a part of their breakfast or lunch in their beard. It’s just kind of gross. Thanks so much for your insight Freida. Very much appreciated. Its really fascinating to hear all of these different perspectives. I am 32 & I legit had to beg & bribe my 33 yr old significant other to clean shave just once 🙄… his excuse, “Bcus I had to do it in the Army all the time & he ‘hates’ the way it feels” 🤦🏼‍♀️… Like bro… do you even knowww what I go through to shave for you? Clearly not. Anyway, I most definitely came to realize that facial hair to men is the equivalent of makeup to women. I love his face clean shave bcus it looks more professional… & less… homeless 😏. Hahaha, I really enjoyed reading your perspective on this topic. Based on many of the survey responses, you are definitely not alone. Thanks for sharing. Good luck!